Peterloo - Upstate Films, Ltd. 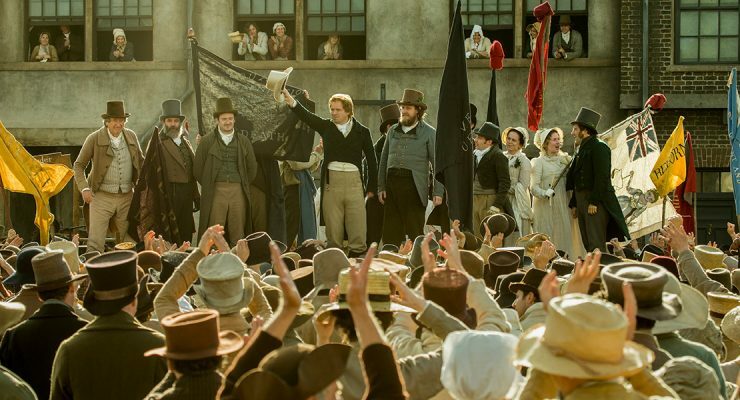 Veteran British filmmaker Mike Leigh (Topsy-Turvy, Mr. Turner) takes a sobering look at the context and consequences of the 1819 Peterloo Massacre — when Britain’s working class began to fight for its rights to representation, up against an aristocracy that was determined to block an encroachment on its own privileges. Four years after the British and their allies defeated Napoleon on the field at Waterloo, a different kind of battle was fought, this time on English soil, at St. Peter’s Field in Manchester — an event that journalists quickly dubbed the Peterloo Massacre. Peterloo began as a riot involving unarmed civilians and British cavalry, and became an infamous flashpoint in the country’s history of parliamentary reform. Leigh tells the story from the perspective of key players: those suffering through unemployment, poverty, and famine in the wake of the Napoleonic Wars on one side; the magistrates and military authorities on the other. Scathing in his depiction of the powers that be, he reserves most of his attention for the Peterloo victims: the protesters, many of them out-of-work textile workers, and those political reformers advocating for their right to vote. Adroitly, and with a fine sense of period detail, Leigh brings this critical event and its history-altering fallout into new light. PG-13 / 2 hrs 34 mins.